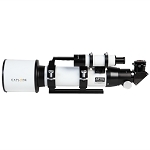 The Explore Scientific AR152, with its larger aperture (6") gathers 44% more light over the AR127 (5") model, providing much brighter images and higher resolution. 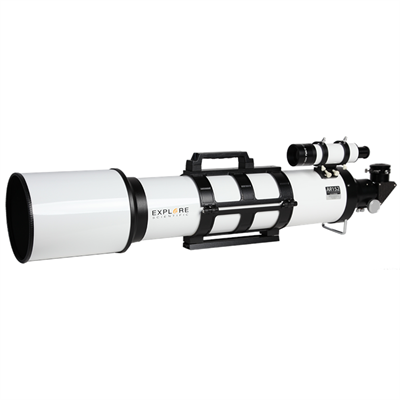 Our goal was to provide an extreme value by providing true diffraction-limited optics at a price that will allow more people to explore the sky with a wide-field large aperture refractor. Images of deep sky objects are stunning at low powers. At high power the moon and the planets are revealed in sharp, high contrast. Classic Crown & Flint Air-Spaced Doublet achromat optics. Enhanced Multi-Layer Coatings (EMD) are deposited on all optical elements to boost contrast and eliminate light scatter. Come with a heavy-duty 2" two-speed focuser. The light-weight 2" diagonal has 99% dielectric coatings for high contrast, bright images. A 1.25" compression ring adapter is included. 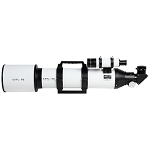 Includes an 8x50 straight-through finderscope with a wide 6° field of view, with front objective focus. All Explore Scientific products come with a STAR Transferable Extended-Life-of-the-Product Warranty. Upon registration, this product will be under warranty for as long as it is manufactured, plus five years.